Less than four years since they made the Oscar-winning No Country For Old Men, the Coen brothers, Ethan and Joel (A Simple Man, Burn After Reading), have returned to the ‘cowboy genre’ with a bang (pardon the pun). No Country For Old Men was a brilliant film. 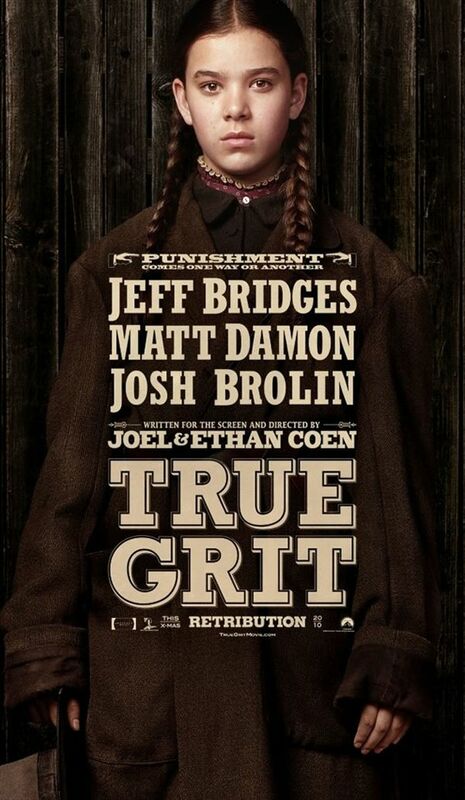 True Grit is even better. The plot for True Grit is quite straightforward. Based in a small town in Midwest America in the late-nineteenth century, Tom Chaney (Josh Brolin – No Country For Old Men, Wall Street 2, American Gangster) killed Frank Ross in cold murder. Frank’s extremely intelligent, precocious fourteen-year-old daughter, Mattie (Hailee Steinfeld), is determined to have her father’s death avenged. After the local law enforcement agency refuses to chase Chaney, Mattie employs Rooster (Jeff Bridges – Crazy Heart, The Big Lebowski, Seventh Son), a drunk and ruthless cowboy to find Chaney. 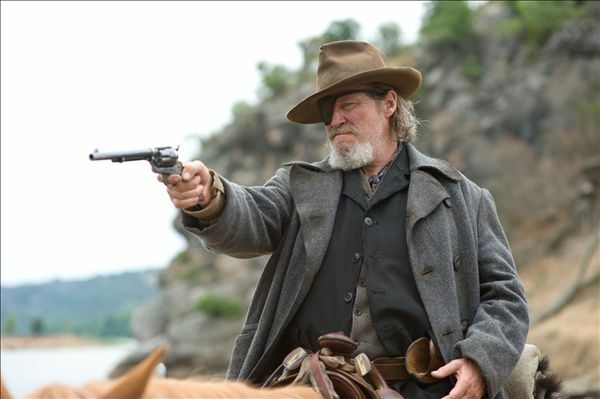 A drunk Rooster, played by Jeff Bridges, trying to shoot accurately on the back of a horse. As Mattie strikes a deal with Rooster; Laboeuf (Matt Damon – The Bourne Identity, The Departed, Invictus), a dumb but wily Texan Ranger emerges. Laboeuf also wants Chaney. The latter is wanted in Texas for the murder of a senator. Despite some differences on where Chaney should be tried (Mattie wants him to be put to justice in her town, while Laboeuf needs to bring him back to Texas or else he won’t get paid), Mattie, Rooster and Laboeuf head off together in search of their man. If the storyline does not make one believe that True Grit should have been a five-star film, the flawless and Oscar-worthy acting certainly will. Jeff Bridges splendidly captures the attitude, habits and language of an aging, drunk-but-funny, Midwest, trigger-happy cowboy. Similarly, Matt Damon illustrates that being a far-from-bright ranger on a horseback comes just as naturally to him as being the secret agent, Jason Bourne. Yet, the performances of Bridges and Damon are cast into the shadows by that of Steinfeld. If the star of No Country For Old Men was the frighteningly serene villain with red-rimmed-eyes, played by Javier Bardem, then Steinfeld is the stand-out entertainer of True Grit. Mattie’s ability to understand the complexities of law; her ability to see through people as if they were opaque, plus her witty tongue are all down to the proficiency of Steinfeld. It almost beggar’s belief that Mattie was played by a fourteen-year-old! Indeed, one will struggle to witness a more assured and mature performance from someone of her age over the coming decade. Mattie attempting to feed the ill-tempered Laboeuf beside a campfire one night. The acting, however, would not be half as impressive if the characters would have been without well-written scripts. They might have got away with it provided they’d have just maintained strong Midwest accents (like Russell Crowe and Christian Bale did in 3:10 To Yuma); but the three main actors do more than that in this movie. Bridges, Damon and Steinfeld adopt a dialogue that one can realistically imagine ‘Middle Americans’ once using (or even still use in some places today). That there are no lapses whilst they talk in this semi-alien tongue makes their performances all the more remarkable. The magnificent acting and dialogue are matched by the choreography, music and landscapes throughout the film. Each scene smoothly slots in, one after another, without interruption. In addition, the music is always fitting for the scene; as are the differing sceneries the Coen brothers have employed, showing us that Midwest America is more than just a desert with a dozens of cacti. In short, True Grit is a model of a film and a realistic portrayal of how cowboys used to go about their business. One does not need to be a fan of Western-style movies to appreciate that from the directing; to the production; to the writing of the screenplay and the music scores; to the acting, True Grit is as close to perfect as a film can be.